I worked about 14 hours today, I think. Mostly I’ve been grinding on getting TDAA trial premiums posted. It’s a much more detailed process than you might think. I meddled in the premiums only to an extent, as I’ve been working on getting the “blurbs” for games written in consistent manner. And when I’m done I have to drive it to PDF, get it posted on the TDAA website, link it to the calendar, and update that file as well. Oh… and I have to record the particulars in my tracking worksheet. Today was a good day though. I can actually see the holes now. This is important. When it’s all a fog or a blur you don’t see the holes. If you see a hole, you can fill it. If you don’t see the hole, you fall in it. You follow me? I thought the world was warming up to an early spring. By last weekend all the ice and snow had melted here and you could feel some warmth from the sun on your cheek. Then on Monday the temperature dropped and it began to snow with renewed earnest. Marsha and I witnessed a weather phenomenon neither of us could remember having seen before… the heavy downfall of snow at a distance. We’ve all seen that in rain systems. When it’s snow, it’s quite impressive. Then it moved over on top of us and gave us a white-out as the snow fell and whirled so furiously we could not see the road in front of our house. The snow fall continued until we had about four inches. When it moved away (to torment the east coast) it left behind a picturesque world in a heavy blanket of fat moist snow. Now I wish that it would go away. This isn’t an announcement or anything. I’m constantly interacting with the draft, making improvements, adding new resources. A lot of it I have to share here. Today I’m bending my head around Snooklers. I believe this is a Jeff Boyer invention. I’m in a bit of a quandary about the documentation of some games. If I see something in the game that doesn’t really make any sense I’m inclined to want to fix it so that it is rational and balanced. But there you go… if I meddle in the games then I’ve passed beyond the simple role of journalist, documenter, or historian; which is what I really what I did with the first two editions of the book. “What man is a man that does not make the world better!” ~ a line from the movie Kingdom of Heaven. I loved the movie tho it was not well received by the critics and had a short run in theaters. Of course it’s in my DVD collection. Snooklers is a point accumulation game with elements of both Snooker and Gamblers. Like Snooker, there is an opening and a closing sequence. Like Gamblers, there are on course challenges that require the dog to work away from the handler. The jokers or gambles are the red obstacles. The Snooker enthusiast should understand this language: Do a red; then do a color. During the opening period, the team must successfully do the gamble sequence of choice in order to earn the right to attempt a colored obstacle, numbered 1-7. The team must attempt all three gamble sequences before starting the closing sequence. As in the traditional game of snooker the red gamble sequence is worth only a single point. And each may be taken only one time. 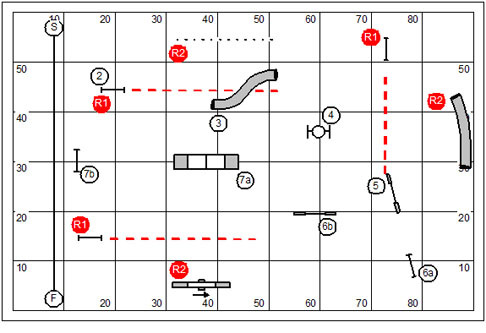 If the sequence is faulted (ie, missed down contact, leaves the containment area and commits to another obstacle before completing the gamble, knocking a bar, or the handler stepping over the line) then the team must move on to another red gamble sequence or begin the closing sequence. After successfully completing a red gamble the team is required to do one of the colored obstacles which have values corresponding to their sequence numbers in the closing. Faulted colored obstacles earn no points. After attempting all red gambles and earned colored obstacles the team begins the closing sequence and may continue to earn points until: the are all done, or an obstacle is faulted; or time expires. Time begins when the dog crosses the start line and ends when the dog crosses the finish line. No points may be earned after the time whistle blows. Legacy variation ~ as the game was originally defined gamble sequences may be repeated. The value of the gambles might have a weight that reflects the difficulty of each. For example, there might be a 5 point gamble on course, a 10 point gamble, and a 15 point gamble. The real difficulty of this variation is that it departs too dramatically from the definition of Snooker both by allowing the repetition of the “red” obstacles and by giving a point weight to them that makes establishment of qualifying scores difficult to assess. There aren’t a lot of examples of Snooklers courses out in the world except maybe in the TDAA. I’m usually disappointed by TDAA “distance challenges” because the line might be 18” away from the obstacles in the gamble as though that were a “challenge”. I’ll let this course of my design sit as a placeholder for awhile. I’ll have to sleep on whether I actually like the design. It seems somehow tougher than the traditional Snooker course; Admittedly, the course was designed for a relatively small space feels a bit crowded. Snooklers is scored Points, Then Time. Snooklers is a point accumulation game with elements of both Snooker and Gamblers. Like Snooker, there is an opening and a closing sequence. Like Gamblers, there are sequences on course that require the dog to work away from the handler. Snooklers is scored Points, Then Time. A world class athlete? This fellow is in both the Baseball Hall of Fame and the International Boxing Hall of Fame. Who is he? Questions comments & impassioned speeches to Bud Houston: BudHouston@hughes.net. Check out my latest publication the Jokers Notebook ~ Dog Agility Distance Training ~ Issue #0 ~ August 2010 available on the Country Dream Web Store: http://countrydream.wordpress.com/web-store/ . Readers of my web log get a discount: Enter “special00” in the box for the discount code. And that will take $5.00 off the price of the order. This entry was posted on February 10, 2011 at 8:37 am and is filed under Course and Sequence Design, Games and Courses, TDAA Course Design College. You can follow any responses to this entry through the RSS 2.0 feed. Both comments and pings are currently closed. Damon Runyon. My first thought was Ring Lardner, but Ring Lardner is better looking! 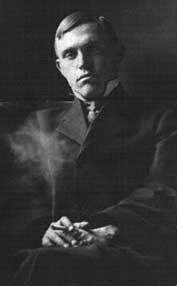 It is indeed Damon Runyon, who coined the nickname “Cinderella Man”. No he did not play enough baseball for that. It has to be an announcer. Not Cosell. I don’t think he made the Baseball Hall of Fame. Nah, it’s Damon Runyon. He was a sportswriter and newspaperman, and also wrote short stories, some of which were the basis of “Guys and Dolls.” Look him up on Wikipedia–you’ll see the same picture.